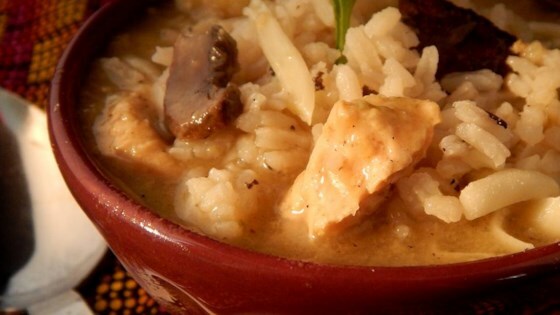 "Curried chicken, rice, broccoli, and cheese soup - perfect for a cold winter day!" In a large saucepan, heat chicken broth. Place milk in a jar with lid, and add flour; shake until well blended. Add milk/flour mixture to chicken broth; stir until boiling. Stir in curry powder, and reduce heat to medium low. Place chopped chicken breast, onion, and celery into skillet. Cook at medium heat until chicken is cooked and vegetables are soft; add to soup. Stir rice and optional vegetables into the soup. Simmer for 30 minutes, stirring. Stir in grated cheese before serving. a lot of work but worth it!! Very good soup/chowder for a winter day! My son wasn't crazy about this recipe, but my husband and I enjoyed it.